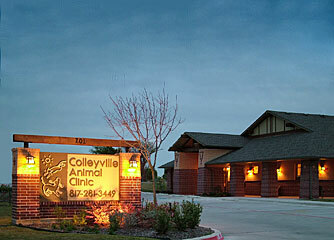 Colleyville Animal Clinic emphasizes monitoring and maintaining the health of your pet. Dr. John Blick and Dr. Mark Wilson use the latest technologies and procedures to keep your pet healthy for years to come. What really makes your best friend happy here isn't simply the services we provide, it's how we provide them. We treat your pet as though it were our very own. We take the extra time to remember your pet's name, to discover its likes and dislikes, and learn all the things that make it so special. We offer complete veterinary services, including checkups & consultations, geriatrics, vaccinations, dental care, dermatology, and spay/neuter surgery. Visit the services section of our web site for complete details. We care for more than your pet. We also care about you. That's why we make the extra effort to personally telephone you following a major or minor procedure on your pet. It's also why we'll always send your pet home in tip-top shape. And there's more. Getting care is a breeze with our same-day appointments, flexible weekday and Saturday hours, and knowledgeable staff. At Colleyville Animal Clinic, we know that the best way to show pets you care is to give them the best health care possible. That's why we've been the home of gentle, personalized pet care for over 27 years. From dentistry to dermatology, from head to tail, we provide a wide range of services with a lifelong commitment to the health of your pet.